The Brandenburg Gate is an iconic military monument. It is a triumphal arch located in Berlin, Germany. It symbolizes peace and unity. It was designed by Carl Gotthard Langhans. This structure was commissioned by Frederick William II to serve as an entrance to Unter den Linden, which led to the Prussian palace. The construction started in 1788 and was completed in 1791. There are total of twelve columns in the gate that form five walkways. Six columns are on the entrance side and six on the exit. The central and widest walkway was reserved for the royals. On January 30, 1933, the Nazis celebrated Hitler’s seizure of power by holding a torch lit procession through the gate. After this, the Brandenburg Gate was used as a Nazi symbol. The official opening to traffic was held on December 22, 1989 and approximately 100,000 people came to celebrate the occasion. There is a statue sitting on top of the gate. It has a chariot drawn by four horses and the goddess Victoria is riding in it. The repairing and restoration work of the gate took place in 2000 and the total cost was 6 million Euros. The gate is decorated with reliefs and sculptures and most of them are based on the exploits of Heracles. The design of the gate has been inspired from the Acropolis in Athens, Greece. This gate is flanked by two small buildings, Haus Liebermann and Haus Sommer. The U.S. President John F. Kennedy visited the Brandenburg Gate in 1963. When the Berlin Wall came down in 1989, the gate became a symbol of unity. Declan, Tobin. " Brandenburg Gate Facts for Kids ." Easy Science for Kids, Apr 2019. Web. 25 Apr 2019. 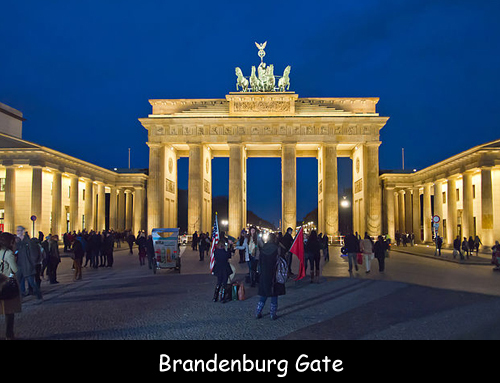 < https://easyscienceforkids.com/brandenburg-gate/ >.